I don’t often get a chance to stop by the MB Boutique, but I was able to get over there on Monday. The man at the front desk was very friendly and helpful. I went in knowing I wanted the Toffee Brown or the Lavender Purple. They didn’t have LP so TB it was. 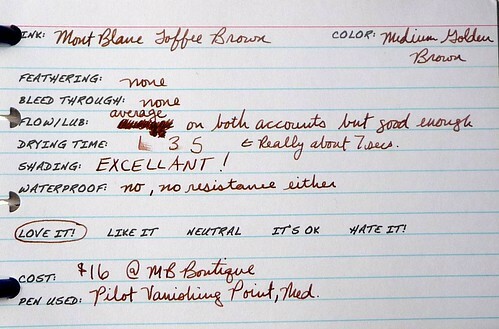 The salesman allowed me to use a MB146 with a medium nib to dip test the ink before I bought it. I immediately fell in love with it. 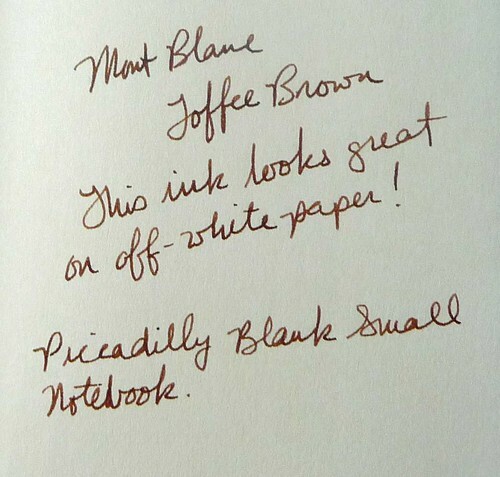 Now it should be noted that I’m not really a “brown ink kind of person”. I generally don’t care for brown inks with the exception of R&K Sepia and JH Cacao du Bresil, but this one just sang to me. This ink is true to it’s name. It looks a bit like homemade toffee. It’s a rich medium brown with yellow and red undertones. It’s well behaved as all MB inks are, and the bottle is super functional (click the above picture for more photos of the bottle and packaging). Flow and Lubrication is average: not too wet and not too dry. There is absolutely no water resistance whatsoever. Klutzes beware! Body and cap, even underneath the transparent lacquer, decorated with ornaments recalling the binding of the book “The Miroir or Glasse of the Synneful Soul”. If you get a chance to look one over you should! ← Hello and Welcome to Our New Home!